Smart bulbs are widely known as a successful offering in home automation and IoT products, as they are internet-capable light bulbs that allow home users to customize the colors, schedule on and off times, and control them remotely. Some even play music and could improve your sleep. Any device that can wireless connect with phone applications must be rigorously tested for potential safety and privacy implications, so our security research team investigated the smart bulb market. In our research laboratory, we tested different bulbs to see different perspectives. 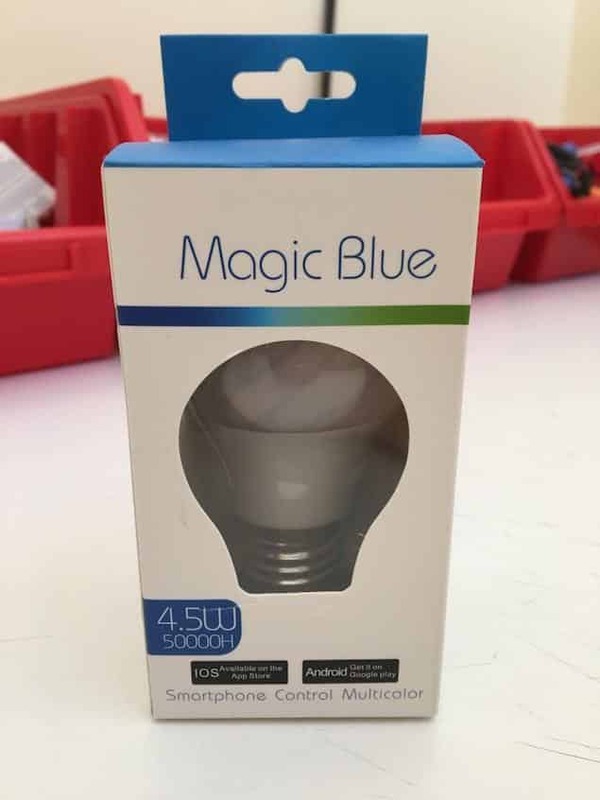 In the end, we tested with one of the most popular smart bulbs in the market – Magic Blue. The price for this bulb and similar ones are around 5€ to 10€, depending on the seller. Other bulbs have similar characteristics, and the Android application supplied even works on different bulbs. As a side note, some Bluetooth Low Energy (Bluetooth LE, often referred to as BLE, formerly marketed as Bluetooth Smart) bulbs on the market are sold as Bluetooth Smart, but in reality, they’re Bluetooth Smart Ready and the technology used to communicate with the mobile application is the radio frequency communication (RFCOMM) protocol on the host Bluetooth stack and not the Low Energy Attribute Protocol (ATT). We focused our research on bulbs that used ATT to communicate. The pairing method for our target is Just Works, which allowed us to sniff the communication. After a while, we get traffic that we can analyze using Wireshark. By the way, we could also use the HCI dump log from Android, but we wanted to keep things as real as possible. FFE9 is, in fact, the only writable characteristic. We clicked on the mobile app for a “reddish” color, so let’s try to extract this hex value sent to the bulb. 56 is definitely a command byte because other options, such as music, use a different byte. If we go to the mobile app, it shows the exact corresponding RGB pick – 255, 13, 7. For the sake of this research, we don’t need anything else. We can now play with color and warm levels, which for us is the only thing needed to exfiltrate data. The main plan for exfiltration was to use light as a channel to transfer information from a compromised device to the attacker. Light can achieve longer distances, which was our goal. Imagine the following attack scenario: a BLE device (smartphone) gets compromised with malware. The malware steals the user’s credentials. The stolen information is sent to an attacker using a BLE light bulb nearby. The attacker receives the exfiltrated data using a smartphone, which could be connected to a telescope for wider range, without the victim noticing that any type of exfiltration took place. For that reason, we chose to use the blue channel to create a stealthy air gap exfiltration. We created two apps, the first app for sending the exfiltrated data and a second one for receiving it. The app that transmits the information changes the blue light intensity – weaker for binary 1 and stronger for binary 0. The app has two options: Normal mode and Stealth mode. The first one may be visible to human-eye and the stealth mode is very hard to detect because of the variations of shades of blue used. The transmission is quite simple; for each byte there is a preamble and trailer. The receiver app uses the smartphone camera to detect and process the data (low frames per second, or FPS). The receiver doesn’t even need to have BLE, just a camera. We have a few videos to demonstrate the proofs of concept; Pedro Umbelino presented one at hack.lu. This mode on the smart bulb exfiltration app is visible to the human eye, but at the same time allows the attacker to reach higher distances using, for example, a telescope connected to the smartphone. This mode uses the shades of blue that prevent the human eye from easily noticing it. This stealthy mode makes the air gap exfiltration very hard to detect. The focus here is that the receiver reads and waits for the RGB modification and decodes the exfiltrated data. An important note to mention. These methods will work on every smart bulb that allows control by an attacker. In the future, we would like to create a better proof of concept that allows us to test a database of vulnerable bulbs and even implement AI to learn and implement new bulbs along the way.